(March 16): Southeast Asian stock markets ended higher on Thursday with Indonesia closing at its highest in nearly two years, as the US Federal Reserve raised rates but signalled a more gradual pace of monetary tightening this year than many had expected. In a move spurred by steady economic growth, strong job gains and confidence that inflation is rising to the central bank's target, the Fed raised rates by 25 basis points, its second in three months, with Chair Janet Yellen emphasizing that future rate increases would be "gradual". In Asia, MSCI's broadest index of Asia-Pacific shares outside Japan rose as much as 1.7% to its highest level in 20 months, while US stocks rose sharply overnight. "The rate hike works in two ways for the Asian markets," said Taye Shim, head of research at Jakarta-based Mirae Asset Sekuritas. "For one, I think the "accommodative" stance of the Fed, despite the hike, was well received by the market. Emerging market equities are likely to get a breather from the uncertainties related to the pace of rate hikes." "Secondly, rate increases driven by inflation should bode well for EM equities as companies have a good excuse to increase their selling prices." In Southeast Asia, banks, which usually tend to benefit from rate hike cycles that allow them to charge more money for loans, were among the top gainers. Indonesia closed at its highest since April 2015, driven by financials and consumer discretionary stocks, with Unilever Indonesia, Telekom Indonesia and Bank Rakyat Indonesia spearheading gains. An index of the 45 most liquid stocks rose 2.19% to its highest in nearly four months. In Singapore, gains were led by oil rig builder Keppel Corp as global oil prices rose, and on a weaker dollar, which makes greenback-denominated oil less expensive for holders of other currencies. The Straits Times Index climbed to its highest level in more than 18 months. Malaysia's second-largest lender by assets CIMB Group supported gains on the index, hitting its highest mark in 21 months. 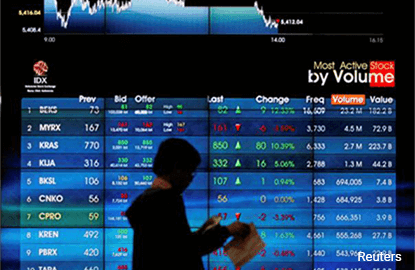 Philippines rose modestly, helped by industrials, while Vietnam eked out small gains.